The ability to manifest that vision — for air power to reach anywhere on the globe in a matter of hours — is fundamentally dependent upon aerial refueling. In any air campaign, the factor limiting sortie generation has less to do with the number of fighters, bombers, or airlifters available than the number of air-refueling booms in the air. Today, that air-refueling boom demand is predominantly met by a fleet of approximately 400 KC-135s, whose average age is nearing 60 years. Even the Air Force’s “young” fleet of tankers, 59 KC-10s, averages over 30 years old. While the advanced age of these aircraft stands as a tribute to the engineers who designed them and the maintenance teams who sustain them, they are at increasing risk. If a fleetwide problem were to affect these geriatric airplanes, military options fall off the table. There is no alternative when it comes to this mission that underpins America’s global reach. The other services do not provide this capability, and allied air forces cannot match it. That’s why the KC-46 is so important. The Air Force now has a solution. The practical solutions that Secretary Heather Wilson, her acquisition chief Will Roper and Boeing devised to get the KC-46 into the operational force sooner rather than later are commendable. A path forward to resolve the discrepancies that remain with the aircraft’s remote vision system and boom will now not impede getting the much-needed tanker into operation. The basic reality is that the KC-46 is much more capable than its legacy counterparts. They include improved fuel offload effectiveness, new battle management capabilities, 21st century networking, sustainment-focused data analytics, next-generation situational awareness and defensive countermeasures. The KC-46s rolling off Boeing’s line today increase the mission-based affordability and effectiveness of America’s military in an era of growing threats. Headlines have focused on the 17 months of delays and extra costs incurred by the aircraft. However, while late delivery is unfortunate, it pales in comparison to schedule slips experienced by other weapons systems across all the services. As for cost, Boeing will absorb the increases for correcting the remote vision system, and the Air Force will fund additional work needed for the boom. 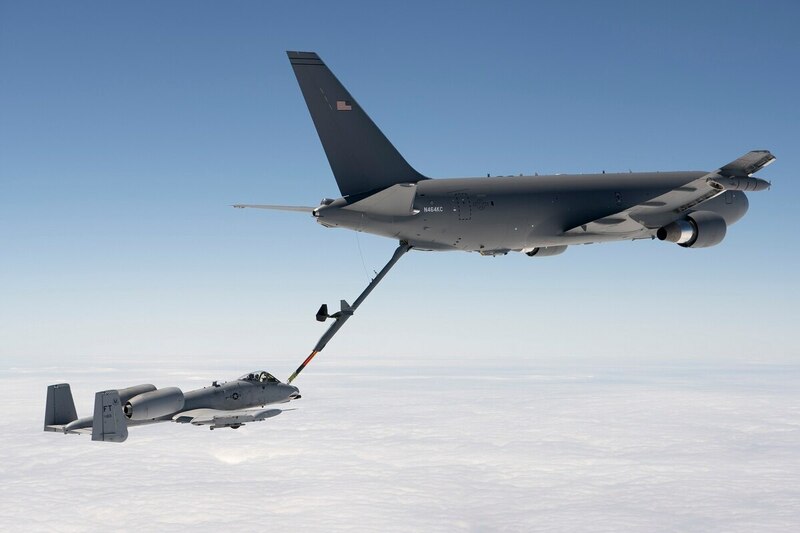 As the Air Force looks to the future, it is important to understand the potential of the KC-46 not as simply a linear extension of its predecessor refueling aircraft. In a world increasingly defined by the ability to gather, process and collaboratively share information, the KC-46 will serve as a valuable node in the combat cloud paradigm of warfare. Looking to the future of the KC-46 buy, two things are clear: Rate and volume will be crucial — a faster rate of production and a larger inventory is required. The faster the Air Force can acquire these aircraft, the sooner it will realize greater operating efficiencies. Not only is this true because of the new tanker’s enhanced capabilities, but also because of the reduced number of resources required to keep new, rather than legacy, tankers in the air. As the KC-135 nears 100 years of service, maintenance bills and depot time out of service will significantly increase along with risk to our combat forces. Retiring older tankers sooner will drive lower mission-sustainment costs. It is also important to recognize that the stated buy of 179 KC-46s is one that does not account for Secretary Wilson’s “Air Force We Need” force size that is driven by actual war-fighting requirements, not simply arbitrary budget restrictions. That force sees the Air Force needing 14 additional tanker squadrons. With an eye to the future, the KC-46 is here today and just in time to meet the demands of the National Security Strategy. Retired Lt. Gen. David Deptula has more than 3,000 flying hours from his time in the U.S. Air Force. He helped plan the Desert Storm air campaign, orchestrated air operations over Iraq and Afghanistan, and is now dean of the Air Force Association’s Mitchell Institute for Aerospace Power Studies.